Genuine Fender nickel plated saddle set for the American Special / Highway One (2006+) Strat®. 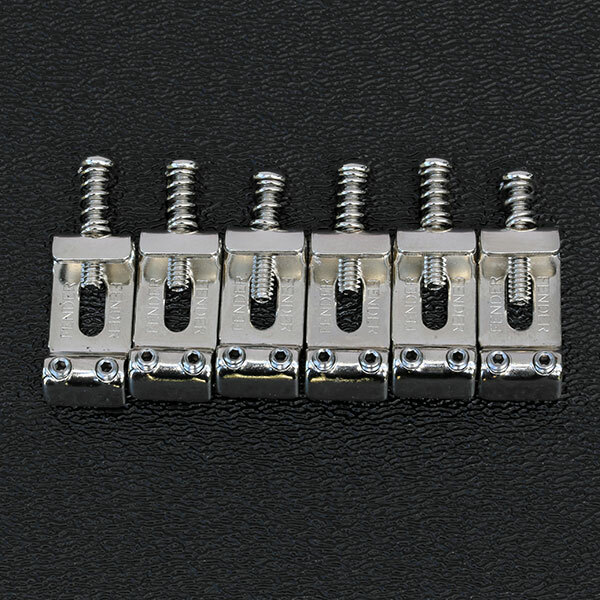 Narrow width 2-1/16" E to E spacing, centered intonation screw saddles. Each saddle is approximately 0.405" in width. Includes #4-40 intonation screws, intonation springs and #4-40 saddle height adjustment screws. 5/16" length saddle height adjustment screws on the two E string saddles and 3/8" length saddle height adjustment screws on the B, G, D and A string saddles. Not for use with the wider 2-7/32" string spacing bridges of the American Vintage Strat®. Also not for use with 2007 and older American series Strat's® that have the offset intonation screw saddles.